i’m still loving jerusalem and this milk pudding is one of the dishes i’ve made most often since buying the book last month. it’s a very frugal pudding that is be made with ingredients you’ll probably already have in your cupboards – milk, sugar and cornflour – but it is then turned into something exotic with a flavoured syrup and pretty garnishes. the original syrup recipe uses a mix of bay and vanilla which i love but i’ve been unable to resist trying rosewater and orange blossom alternatives (just add a few drops when you take the syrup off the heat). i also have thoughts of cinnamon, cloves and maybe star anise. the garnishes can also be altered – pomegranate seeds is suggested which both looks and tastes wonderful; i’m thinking about cocoa nibs for my spice syrup version. start with the pudding, whisk the cornflour with 100ml of the milk to make a smooth paste. pour the remaining milk, along with the water and sugar, into a medium saucepan and heat gently so the sugar melts. when the milk mixture begins to release steam whisk in the cornflour paste. continue whisking until the mixture boils and thickens so it resembles thick custard. remove from the heat and pour into six small bowls or glasses. cover the top of each pudding with cling film to prevent a skin forming (the cling film should touch the top of the pudding) and place in the fridge for at least 3 hours or until set. for the syrup, place the sugar, water, bay leaf and vanilla pod and seeds into a small pan and heat gently until the sugar melts. remove from the heat and allow to cool. 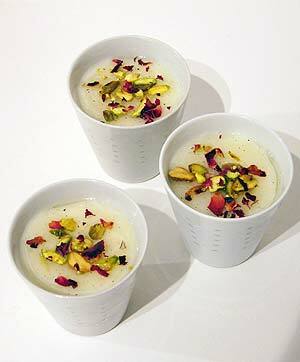 to serve, top each pudding with a tablespoon of syrup and a sprinkling of coconut, pistachios and rose petals.